substantial victories in the future. States since the beginning of July. On Sunday in the Berlin-Friedrichschain neighborhood [a formerly East Berlin district with a strong left, antifascist, punk, alternative, international, and hipster scene] there was a brutal attack from Neo-Nazis. What happened precisely? Sunday morning around 6 o´clock, near the Frankfurter Allee subway station, Neo-Nazis first attacked leftists and then also randomly a group of passerby, who luckily were able to flee. As an uninvolved person crossed by, the Neo-Nazis attacked him until he lost consciousness. One of the Nazis dragged him onto the sidewalk, laid his face on the curb and kicked him in the back of the head with all of his might. Read a translation of the complete interview on schalom libertad blog. This July, David Irving, a British neo-fascist and fraudulent historian, goes on the road in the United States, planning to hold approximately one and a half dozen speaking engagements over the course of a month. As militant anti-racists and anti-fascists, we are making a public call for resistance at each stop along the way of this tour. David Irving is a British writer of histories who has been involved with the fascist political scene since the 1960s. Always known for the pro-Hitler bias of his books, approximately two decades ago Irving made the transition to being a fully-fledged Holocaust-denier, when he testified at the trial of neo-Nazi Ernst Zündel in Canada, and also arranged the publication of Fred Leuchter’s widely-refuted report on gas chambers at Auschwitz. In addition to spreading blatant historical lies, Irving has publicly stated that “The Jews are the architects of their own misfortune”. Unsurprisingly, Irving has been an extremely popular speaker at neo-Nazi rallies in Germany. In the British libel case Irving v. Penguin Books and Lipstadt, the final ruling in favor of the defendants confirmed that Irving “is an active Holocaust denier” and that “he is anti-Semitic and racist and that he associates with right-wing extremists who promote neo-Nazism.” In 2006, Irving was jailed in Austria after pleading guilty to a charge of “trivializing the Holocaust”, which is a crime in that county. Since his release, Irving has been marketing himself as a former “political prisoner”. Irving’s current tour focuses on “"Re-writing history, using the decoded Nazi messages" (see: http://www. focal. org/speaks/index. html). The re-writing of Third Reich history—especially in relation to the Nazi “Final Solution” for Europe’s Jewish population—is a major preoccupation for modern neo-Nazis and neo-fascists, who correctly believe that memory of the Holocaust is a significant barrier to the mainstreaming of their beliefs. The Holocaust is denied so that, paradoxically, it can be repeated. Wherever Irving appears, he is backed and promoted by virulent anti-Semites and fascist organizers. We invite you to help this effort along, by organizing in your own community. The exact location of Irving’s talk in each city has not been made public, due to Irving’s fear of encountering the opposition he so richly deserves. Any determined group of individuals ought to be able to pinpoint the event location in their city, however. Many of these events are probably booked under false pretexts, and venue owners may not necessarily know who they are hosting. Further dates may be added (or subtracted!) as the tour progresses. Irving also plans to speak on the East Coast later this year, although dates have not been announced for this yet. Let’s set the tone for the East Coast wing of Irving’s tour right now! No platform for fascists, no compromise! attitude towards, and responsibility for, the treatment of the Jews." exonerating the Nazis from the extermination of Jews during World War II. 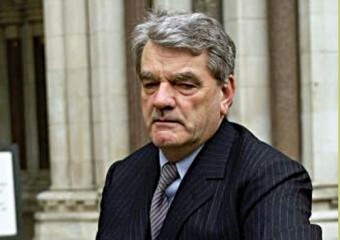 David Irving is an apologist and proponent of fascism. were forced to retreat to the basement of the building. clandestine fascist affair and hand them a lesson they won't soon forget. being directly confronted and opposed.